Rich, fertile soil with excellent drainage. Excellent. Most popular garden irises are hardy to -25F (-32C). Topdress with rich compost in mid spring, after new growth appears. Fertilize with a liquid fertilizer in midsummer. Allium, Daylily and Salpiglossis. Showy iris blossoms look especially beautiful when they rise above the foliage of low-growing flowers with fine-textured foliage such as lobelia or sweet alyssum. Set out plump rhizomes with a fan of foliage attached in spring, just as new growth appears, or in early fall. Plant shallow, so that the rhizomes are barely covered with soil. 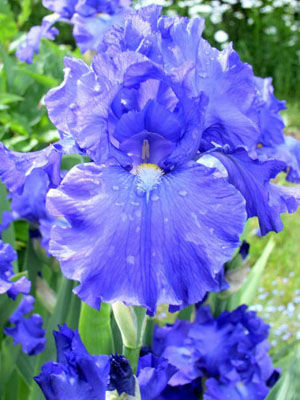 Allow 12in (30cm) between large-flowered bearded irises. Siberian iris roots should be planted 6in (15cm) apart. Iris may not bloom for a year after they are moved. Choose early and late-blooming varieties to extend the iris season. Several newer varieties will re-bloom in the fall with good care. Cut irises for arrangements as soon as the buds show good color; they will continue to open indoors. As the flowers fade in the garden, trim them off with scissors or pruning shears. Several insects damage iris roots. When digging and replanting an old plot, cut away pieces of injured root. Siberian iris have few pest problems, and are seldom eaten by deer.